Like many people, I love a good cup of coffee. And I’m always looking for ways to replicate takeaway coffee at home – I’ve got a Nespresso machine which is fab for espresso. But the options for an Americano at home never quite seem to hit the spot. I have a French press but I always find that the second cup from it starts to taste over brewed and bitter. Plus it never seems to keep the coffee as hot as I really want. So when I saw the Oomph Portable Coffee Maker*, I was really intrigued. The Oomph launched to the general public in 2016, following a successful Kickstarter campaign. You may have also have seen it appear on Dragons Den on TV. It’s a revolutionary coffee maker which is designed to provide the ultimate takeaway coffee at home. The sleek BPA-free plastic body contains a double brewing chamber and fully integral piston press. It also keeps your coffee hot for up to an hour, and you can drink your coffee directly from the Oomph. That makes it an ideal replacement for expensive takeaway Americanos. Using the Oomph is really simple – it’s very similar to making coffee in a cafetiere or French press. You simply add around 24g of ground coffee, and top up with water that’s just off the boil. There are maximum lines for both coffee and water on the side, so you don’t need to worry about overfilling. After leaving your coffee to brew (1 to 2.5 minutes), you press down on the plunger. This locks into position at the bottom, so that it stays firmly in place. You can then either decant your freshly brewed coffee into a mug, or drink it directly from the Oomph. It’s so convenient for coffee on the go! With a traditional cafetiere, the grounds stay in contact with the water after you press down the plunger, and the extraction process continues. This means that even if your first cup tastes perfect, the second cup can taste overbrewed and bitter. But when you push down the plunger on the Oomph, it seals the coffee grounds away from the water. So the second cup will taste exactly the same as the first cup, no more overbrewing. You also have more control over the strength of your coffee, compared to a French press. And if you’ve ever had to throw away a whole cafetiere of coffee because it’s underbrewed and sour, you’ll know what a benefit this is! 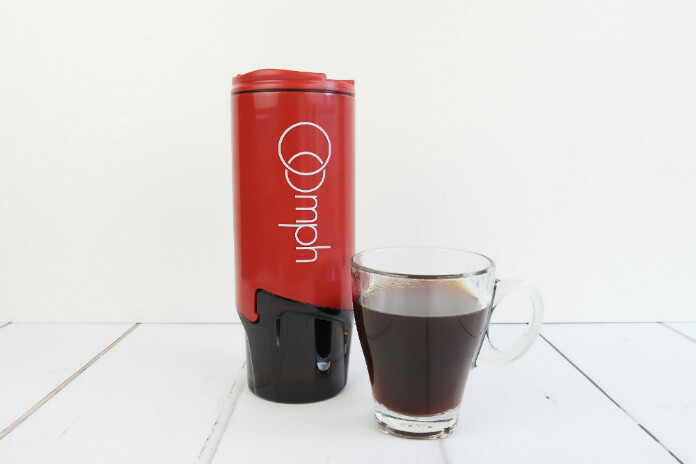 The Oomph allows you to sample your coffee after a first brew, and then if it needs a little longer, you can pull back the plunger and brew again. The water is drawn back through the grounds, and after the second brew you can press down the plunger and sample the coffee again. It’s a much more precise process than with a cafetiere or French press. The tough BPA free plastic construction is much more suitable for travelling than a glass cafetiere. I think that this will be great to pack in my suitcase when I’m staying away. I really miss a good cup of coffee in the morning when I’m staying in a hotel. But do remember that the Oomph hasn’t been designed to be watertight, so you can’t just throw it into your bag when it’s full of coffee! And unlike a cafetiere, the coffee will stay warm for up to an hour. I prefer my coffee scalding hot, but even after 30 minutes I still found that my coffee was hot enough for me to drink quite happily. 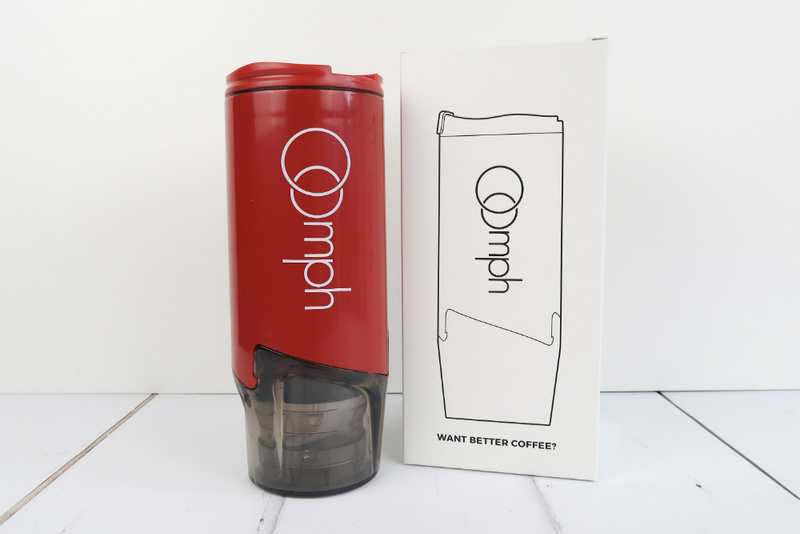 The Oomph Portable Coffee Maker costs from £39, and is available directly from the Oomph website, where they also stock their own limited edition coffee. I really like the Oomph – it’s certainly the best way I’ve found to make an Americano at home. It looks very sleek and modern, and is very easy to use. Coffee made in the Oomph has none of the bitterness that can come from overbrewing. It’s smooth, and tastes great right to the last drop. It also stays hot for much longer than coffee from a cafetiere. The coffee maker comes apart easily for cleaning, and the BPA free plastic body means that you don’t need to worry about cracking a glass jug. Using the Oomph has definitely changed my morning coffee for the better. I can prepare the Oomph and take it up to my office so have delicious fresh coffee while I work. It will also be fantastic to take away with me when I’m travelling, and would be great for anyone who likes to pick up an Americano on the way to work. You could even take it along on camping trips! If you love great coffee, then this giveaway is perfect for you. One lucky SallyAkins.com reader will win an Oomph coffee maker, so you can enjoy the smooth coffee it makes for yourself. To be in with a chance of winning this fantastic prize, simply log into the Rafflecopter below and answer the question. There are additional social media entries that you can use to boost your chances of winning. The giveaway is open to UK entrants only, and will close at 11.59pm on 23rd October 2017. The question you need to answer is: The Oomph makes a fantastic cup of coffee that you can drink at home or on the go. Where would you use your Oomph? I’d use mine at home – a coffee curled up on the sofa sounds heavenly at the moment! At home – I drink at least 8 mugs a day! I would have it whilst I was at work – we don’t have a coffee machine!!! I love to go out on long, country walks. This would be the perfect companion! This would be great for the train on the way to work! I would give it to my sister to use on the way to work. I would use mine at work! I’m a builder so quite a lot of the time the customer is at work so this would be brilliant! On the school run, on the way to work and to keep me going during swimming, gymnastics and football lessons. I would use it on weekends away instead of the yucky coffee you often get on hotel hospitality trays. Well, I’d actually/maybe consider giving it to my husband. He’s a teacher,and he can never get a decent cup of coffee at school! On my allotment – it would be really appreciated then. I would use this at home in my kitchen probably every morning!! I wouldn’t be using it; my hardworking and coffee-obsessed fiancé would, probably during his morning break at the school where he teaches! This sounds ideal for making a good cup of coffee when you are taking long car journeys. I would use it mostly at home but would take it when I stay at my parents too! I would use it at home. I can’t function without that first cup of coffee in the morning. id love this to be able to use it at work. The coffee there is like dishwater! I think I would probably use a coffee machine like this on family camping trips. On the walk into work. Love a great coffee and a refill too even better. At the weekend after a long walk. At home when i want a quick and satisfying coffee but also on the move. I think I’d have it on the go in the car. I would use it on my long wintry dog walks would keep my warm and happy! we drive to romania every summer so id bring this along! I would use it at work – beats instant coffee any day! On my desk at work! On the way work or when we are travelling in the UK. Such a great product. My partner is more of a coffee drinker than me, he’d take this to work! I would mainly use it ‘on the go’ but also sometimes at home or away. At home, as well as on the train going places. I would take mine to work and use it during my 13 hour shift! To work! To carry soup! I would take it to the office. i would use it for work, saw this on Dragons den, i thought it was a brill idea, shocked they didnt go for it, as there was a problem with the flap on the lid. travelling to my lectures on the train!! I would use it during my break at work! I would keep it at home to make my morning coffee to take to work with me. When I’m doing my volunteer dog walking after a few hours I need coffee. Great to take anywhere – save on the cafes and fast foods. I’ll be using this at home daily, and on weekend drives! I love a coffee when i get to work so this would be spoon! I’d use my Oomph at work as the machine coffee is undrinkable and this would be a lovely treat. I’d definitely use it when we travel. I hate instant coffee and always end up drinking it in hotels because I’m desperate for my morning coffee. I would use mine at work or on the train. It is a neat little gadget. I’d definitely use it for my journey to work! On days out, would be perfect! I would use mine at home and at exhibitions. This is incredibly clever! I’d use it on my early morning journeys to work! I’d use it at home, and also on camping trips and trips to the park. I would take mine every time I went on a trip/holiday/backpacking etc so that I can enjoy good coffee EVERYWHERE! Life is too short for bad coffee. I would use it at home – very useful product. I’d use mine at work – our coffee is almost the worst I’ve tasted! I’d use mine on my way into work in the morning. I’d take it to work. The coffee there is awful. I’d use it at home in the evenings. I would use it when I go for a walk as a much needed drink. I would use mine in lots of places! Like on the go if i’m travelling or commuting, at home if i’m home. Id use this watching my sons football match on these cold mornings. My husband would use it when he is driving around at work. I’d use it at home, mainly because I wouldn’t want my workmates to knick it but also, because I’d love to have a nice, non instant coffee every morning when I wake out. This looks absolutely fab for taking to work! I’d use it on our daily dog walk. Thanks for the competition! I’d take it to warm me up watching my daughter play football outdoors on Saturdays and Sundays! I’d use it at home! I would take it to drink while sewing or using the computer at home. If I won, I would gift the prize to my brother. He would make use of it in a variety of places, as his work involves travel. Definitely at home to indulge my senses and tastebuds from my amazing coffee. At work never any decent coffee there. Sounds like a great idea for using on a morning walk! Sounds like this would be perfect for work, there is a coffee machine but nothing beats a fresh brew. I would take it with me in the car , so I always have my coffee with me . ooh how lovely. I’d take it everywhere with me, I can’t live without my coffee! I’d use it on my way to work, at work, on my way home and at home! I’d use it at home and work. Hubby would use it whilst fishing and camping overnight. I`d use it on the train on the way to work. I would use it absolutely EVERYWHERE! Being a coffee addict, this prize would be literally a dream come true ☺. On my journey to work – would be lovely. Take it to work so i can have some lovely coffee instead of the rubbish we buy. WOW I love this. Looks so compact. My daughter is crazy about coffee. She would welcome this with open arms and copious joy. Id use it everywhere – this mum of twins needs coffee anytime of the day! Absolutely everywhere! I am very particular about my coffee especially when out and about. On my way to work, especially now it’s getting darker and colder in the mornings! Travelling – most hotels & B&Bs supply only instant coffee in the rooms but this would be so much better for an early morning cup! On the way to fetch the kids from school. At my son’s football matches! I would take it to work with me for that very important oooomph that I need about 3pm every day! I’d take it to my mums caravan for a decent cuppa! I’d use it at home and never have to drink bitter coffee again. I’d love to drink a cup of coffee on a windy beach on the west coast if Ireland.